An evening in Leeds… full of atmosphere! The day job has encroached more than it should have done these past few weeks, as my lovely loyal regular readers will know. As a result, Christmas has been steadily creeping up, almost without my noticing, and certainly without my feeling at all ‘Christmassy’. However, this weekend my daughter-in-law came to stay and we decided to celebrate by visiting Brasserie Forty 4, otherwise known as 44 The Calls, in Leeds. (More about this shortly.) 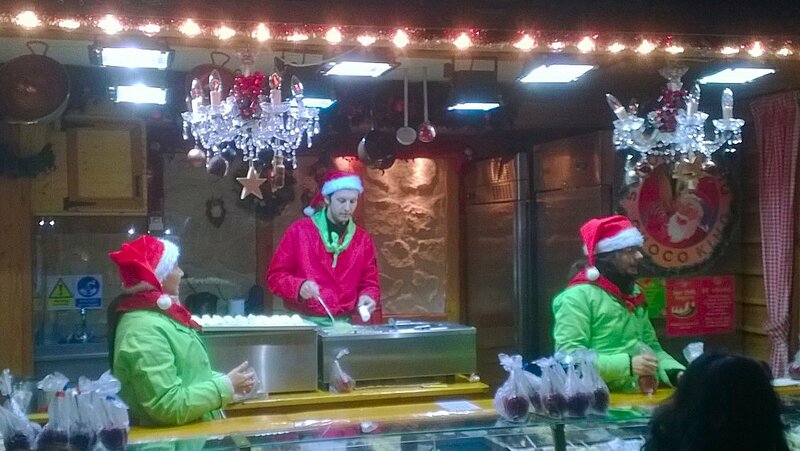 My daughter-in-law discovered that the German Christmas market in Leeds had opened last weekend. It’s been a regular Advent feature in Leeds for several years, but I hadn’t visited it since (I think) 2010. We decided to make a detour. German Christmas markets are renowned for the beautiful artefacts that are sold at them – hand-carved Christmas tree decorations, wind-chimes made from naturally polished stones and all kinds of intricate small gifts fashioned from beeswax. But, more than anything, they are about the food. 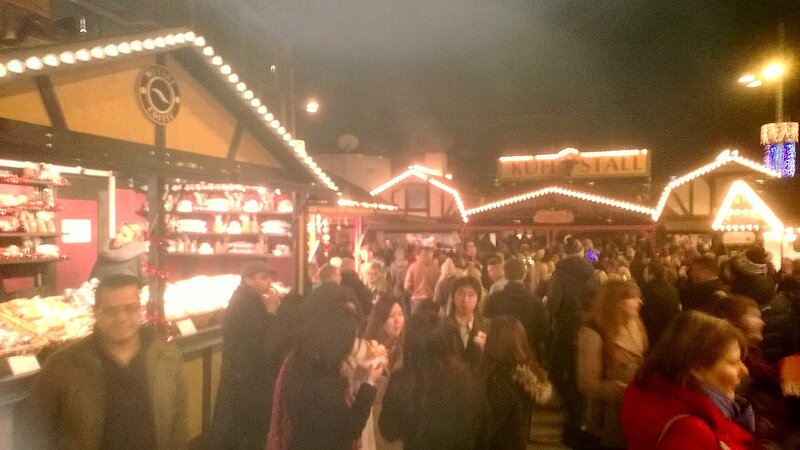 It is street food at its best: currywurst of improbable length unashamedly greedy, tea-breads, candy-floss, giant ginger biscuits (lebkuchen) proclaiming “ich liebe dich” in brightly-coloured icing-sugar and, of course, the drinks: Weissbier or fruit beers, gluhwein or coffee laced with liqueurs. One stall was selling gluhwein with amaretto, rum and cream: a heady drink, I’m certain, and probably one that would have a more significant effect on your head than intended, the following day. So: Christmas is coming and it’s on my radar at last. 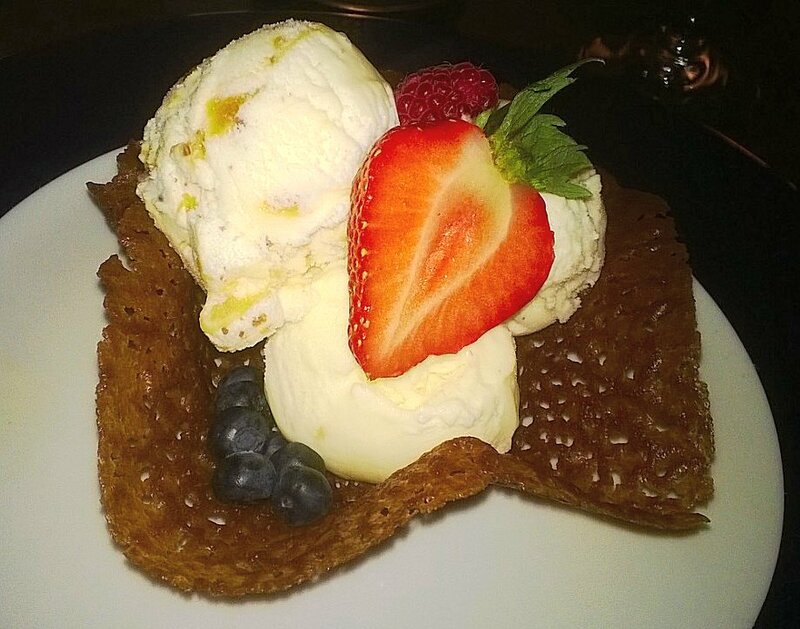 If you happen to be in Leeds at some point during the next four weeks, I recommend a visit to the Christmas market and, if you have something special to celebrate, or just want to get into the mood for the festivities, you could top it with lunch or dinner at Brasserie Forty 4 (but book first!). Cut-throat Charlie? No, far more sophisticated than that! This photograph is of my dentist, Charlie. He’s been my dentist for about five years; before that, it was a colleague of his, called Dave. If I had a picture of Dave to post as well, you’d see that he was quite unlike Charlie. In fact, Dave struck me as being an almost archetypal specimen of the genus dentist: he was slight, wiry, nervy, cerebral and doing his bit to save the earth (a vegetarian, his main mode of transport was by bicycle and he once sang in a choir with my husband). Charlie, on the other hand, although I consider him to be exceptionally skilled and an ornament to his profession, is no-one’s idea of a dentist. If I’d been shown a photo of him before I met him and asked to guess what he did for a living, I might have said that he was probably a bookmaker; or an estate agent; or a very burly jockey; or a rather emaciated sumo wrestler. If he’d been an actor, he would have made an ideal Magwitch in a dramatised version of Great Expectations. Charlie obviously enjoys life. His main mode of transport is a motorbike in the summer, a substantial car (forgive me, I’m no good at brands) in winter. 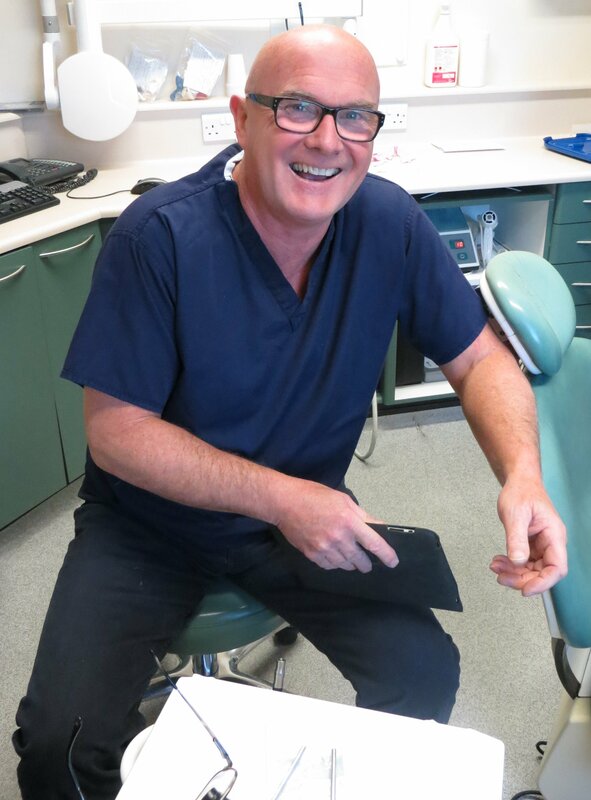 For a dentist, he dresses unconventionally, in leather jackets, jeans and trainers. As my readers know, I like to write occasional pieces about interesting people and I’ve always found Charlie interesting. He’s fascinating to talk to, and I enjoy listening to his take on life while he pokes and pummels at my teeth. When I visited him yesterday, therefore (in tandem with my husband – we try to make our visits to the dentist two for the price of one), I asked if I might take his photograph, and explained about the blog. I gave him one of my Christina James postcards so that he could look up its url. To my surprise and delight, I struck gold! Charlie is an avid reader of crime novels and was only too happy to have his photo taken. Better than that, he offered me an idea for a plot for my next novel. Not only was it excellent, but it was also based on his own scientific expertise: he trained as a biochemist before becoming a dentist. I promised him that I would use the plot and he said that he had several more up his sleeve when I’d exploited that one. I shan’t forget. Future visits to this dentist will be looked forward to with great anticipation, rather than with dread! With his eye twinkling and with his customary geniality, Charlie announced that he’d once thought of how to commit the perfect murder. It would be based on his scientific knowledge and next to impossible to detect. (I won’t give away any more, as the plot that he offered me makes use of the same information.) By this time, I was completely rapt. My husband, however, was still lying prone in the surgery chair and showing some signs of nerves. “Do you think we should change our dentist?” he asked, once we were back out in the street. Yesterday was a real red-letter day for me. I had been invited to give one of two after-lunch talks at Soroptimist International King’s Lynn annual fund-raising lunch, which was held at the Best Western Le Strange Arms Hotel at Old Hunstanton. I was invited to speak by Sue Renwick, this year’s King’s Lynn Soroptimist President, and her colleague, June Muir. I discovered that my name had been suggested by two of my old school friends, Lyn Lord and Mandy North. Both have been enthusiastic promoters of my books and Mandy has attended both of the signing sessions held at Bookmark in Spalding. I was chosen because my books are set in Spalding – not too far away from King’s Lynn (in fact, my brother was born in the Queen Elizabeth Hospital there) – and the group particularly likes to listen to authors whose books have a local flavour. 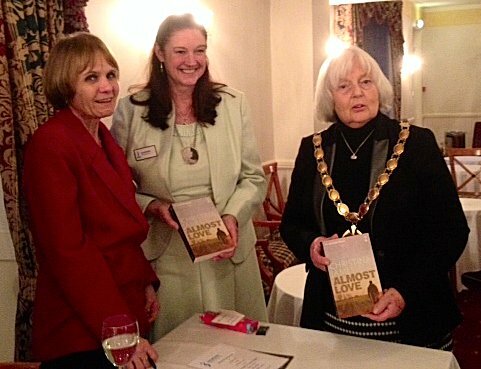 This literary lunch was the fourth one held by the King’s Lynn Soroptimists. The speaker at last year’s event was Stella Rimington (who has a house in Norfolk), so I felt honoured indeed! The audience consisted of ninety-nine lunchers, mostly Soroptimists, with a sprinkling of husbands. The Worshipful the Mayor of King’s Lynn and West Norfolk, Councillor Mrs Elizabeth Watson, was there, and I much enjoyed talking to her. I was privileged to be seated next to Sue Renwick’s husband and had a fascinating conversation with him about migrant workers in Norfolk (a topic in which I’m currently immersed as I write my third DI Yates novel). The local press was in attendance: I shall post links to their photographs when I have them. I had heard of the Soroptimists before, but I didn’t know much about them until I received the invitation, when I made it my business to find out a little more. The first group was set up in the USA, quickly followed by others in the UK. The organisation is now worldwide. Its website explains its mission: We are committed to a world where women and girls together achieve their individual and collective potential, realise aspirations and have an equal voice in creating strong, peaceful communities worldwide. The fund-raising events support particular causes. The money raised from yesterday’s lunch will contribute to respite holidays for Norfolk’s young carers: heartbreakingly, there are children as young as seven looking after infirm or disabled parents. My fellow-speaker was Elly Griffiths, whom I had already met earlier this year at a very successful literary festival event held at Watton Library. Elly spoke first. I know her to be a witty and eloquent speaker (and therefore a tough act to follow!). 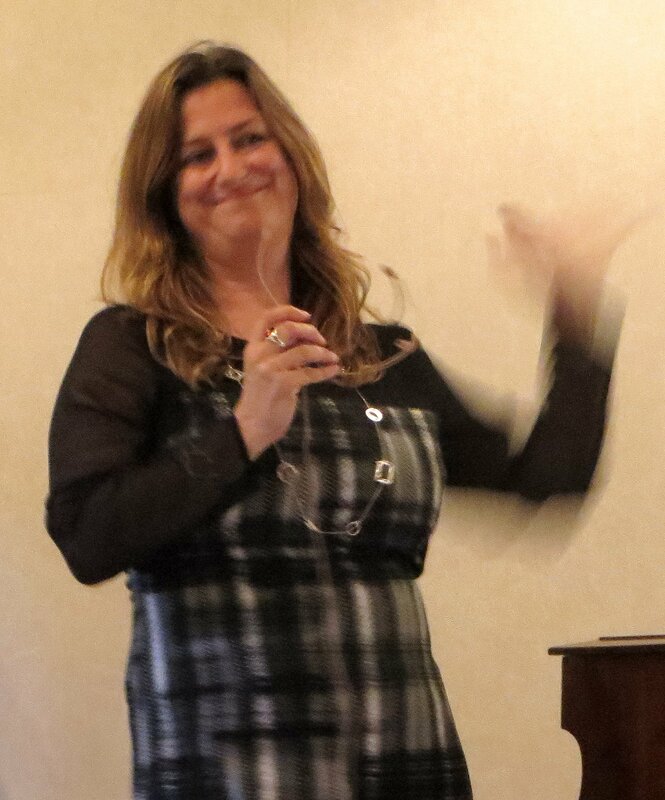 She told the audience how she came to create her academic archaeologist, Ruth Galloway, and read an excerpt from the next Ruth Galloway novel. She said that the inspiration for these books had come from her husband, who exchanged a high-profile, lucrative career as a city ‘suit’ to become an archaeologist. The Galloway novels are set in Norfolk because Elly’s aunt lives there and Elly spent holidays there as a child; she also pointed out that Norfolk is full of bones! My brief asked me how I came to develop the characters in the DI Yates novels. I’ve reproduced some of what I said here in the hope that it may interest readers of this blog, as several of you have asked me similar questions. When I was thinking about where to set the novels, I revisited the Spalding of my childhood (and incidentally some of my most memorable holidays as a girl were spent in Hunstanton). DI Yates’ Spalding is therefore a ‘perfect’ place in the sense that it exists only in my memory and imagination. 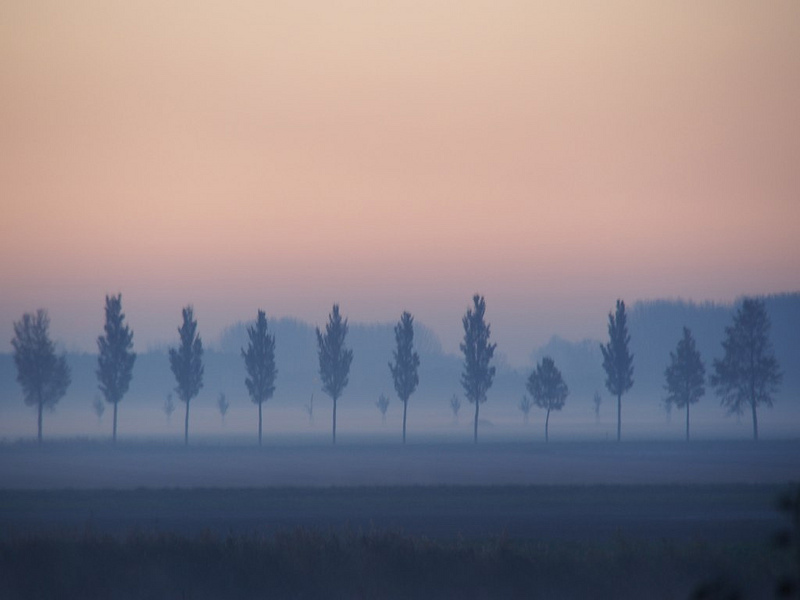 Among the many riches that Spalding and the Fens offer to me as a writer is their wonderful place-names – Pode Hole, Quadring Eaudyke, Gosberton Risegate, Pinchbeck: I know that many readers are intrigued by the promise of romance and mystery implicit in the names of these villages. 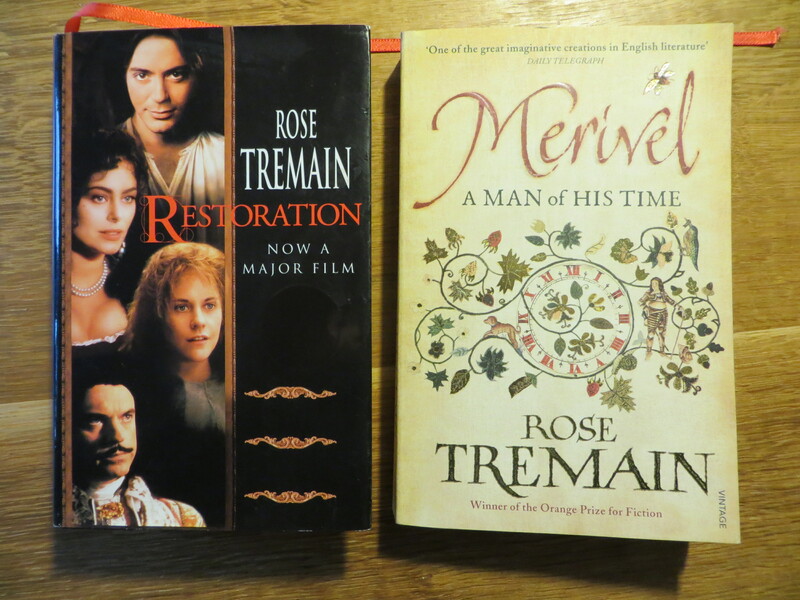 Moving on to Almost Love, I talked about Alex Tarrant and her role in the novel. Alex is the secretary of the Archaeological Society, a prestigious institution very loosely modelled on Spalding Gentlemen’s Society. Some of my readers have told me that they feel that the Archaeological Society is almost like another character in this novel. The story begins with the unexplained disappearance of a famous archaeologist. Several murders take place during the course of the novel and, although she isn’t involved in them directly, Alex is inadvertently the person who provides the links between the various perpetrators; this is in part because she embarks upon an ill-considered affair. I was interested in exploring the disintegration of character of Edmund Baker, the County Heritage Officer and the instigator of this illicit alliance, as he undoubtedly suffers the guilt of betraying his wife. I also spoke about my grandmothers and the extraordinary houses they lived in. I’ve already mentioned the shop at Westlode Street where my father’s mother lived. My mother’s mother was employed in domestic service from the age of fourteen to seventy-four, at first (a bit like Hardy’s Tess!) as a poultry maid. Her second employer sent her to Bart’s Hospital to train as a nursery nurse and from this she worked her way up to become housekeeper to Samuel Frear, last of the great Lincolnshire sheep farmers. She was widowed young, so my mother grew up at The Yews, the Frear family home at Surfleet. Just after I was born, my grandmother, now aged sixty, moved to Sutterton, to become companion to a very old lady who lived at a substantial house called The Laurels. She had been the wife of a gentleman farmer who was twenty years her senior, so he must have been born in the mid-nineteenth century. Like Westlode Street, The Laurels was packed with quaint furnishings, but the most astounding thing about it (though as a child I just accepted it as normal) was that the walls were decorated with many sepia photographs of the old lady’s husband when he’d been on safari in Africa as a young man. These photographs must have been taken in the 1870s or 1880s and in many of them he was accompanied by several black women wearing very little except strings of beads. The book I’m working on now is set in this house. When I began writing it, I had also just discovered that a very famous person was living in the area at the same time, which helped me to construct the plot. It’s about a murder that happens in the present, but is strongly influenced by what happened in the house in the past. I think that both our talks were well-received: many of the Soroptimists came and spoke to us with great warmth and enthusiasm afterwards, and they were extremely generous in their purchases of our books. We were each presented with a pen in a beautifully crafted wooden box that Sue Renwick had made herself – an unexpected and delightful kindness. I’d like to take this opportunity to thank most sincerely all of those present for a wonderful day. I shall certainly take a very close interest in all that they do from now on and hope perhaps to be able to help them, both as a writer and a professional woman, in the future. I hope too that they will come to visit here and perhaps comment, too. He glimmered pale at night. He transfixed with his gaze. Where grows a magic tree. And hear the songs of whales. For the magic tree to keep. And with that, the mariner vanished away! And a magic tree, grown tall. When I saw it on Facebook, I was captivated by the above Flower Bird artwork by the Dutch photographer and artist Koos (pronounced as in ‘rose’) Fernhout; it had a narrative quality and immediately conjured up for me a combination of mental images: Far Eastern art, mystical tales, The Rime of the Ancient Mariner, The Flying Dutchman, the world as it was before humans minimised it, the fantastical stories of sailors returning from voyages of exploration, paradise, the next world. As you will see from the FB conversation, others were also smitten. 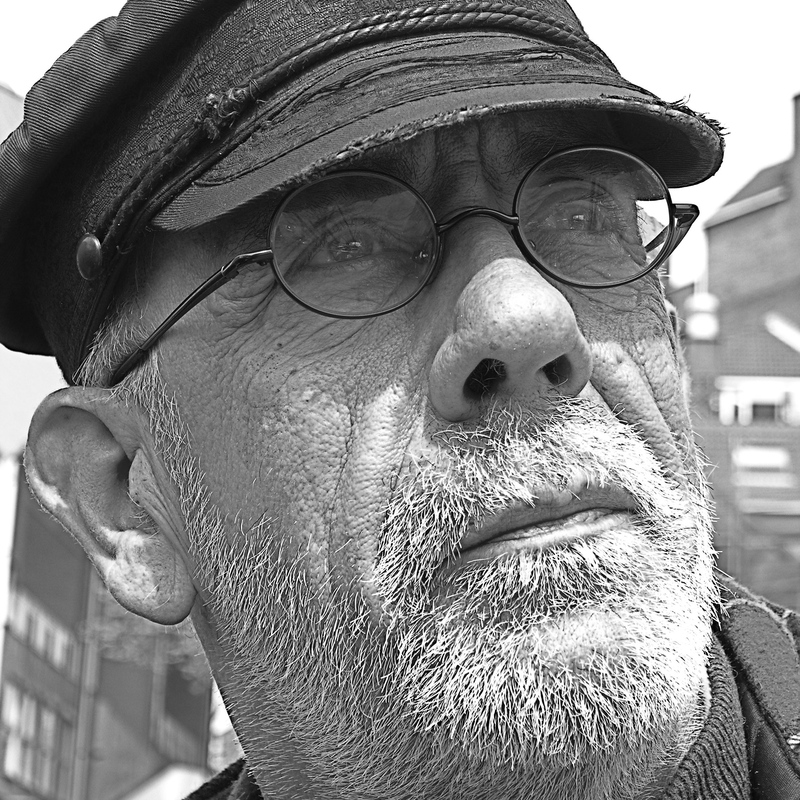 Koos so much enjoyed the poem I felt compelled to write that he put it alongside his image, which is, believe me, quite an accolade. 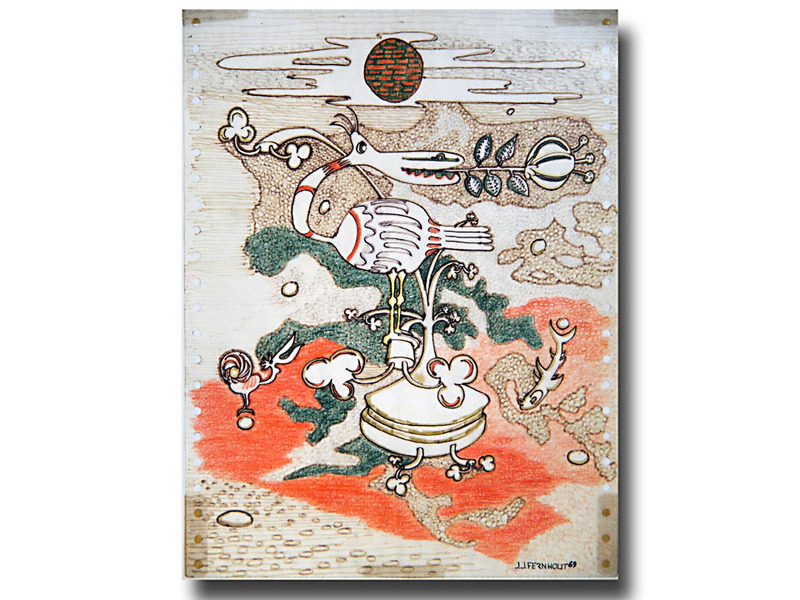 If you are unfamiliar with his work, you may enjoy a visit to his gallery, where you will find that he has an unerringly gifted photographic vision. To whet your appetite, I have also included an example below. Incidentally to all this, Koos happens to be a resident of the barge community I have described here. Many thanks to him for the pleasure of posting his pictures today. 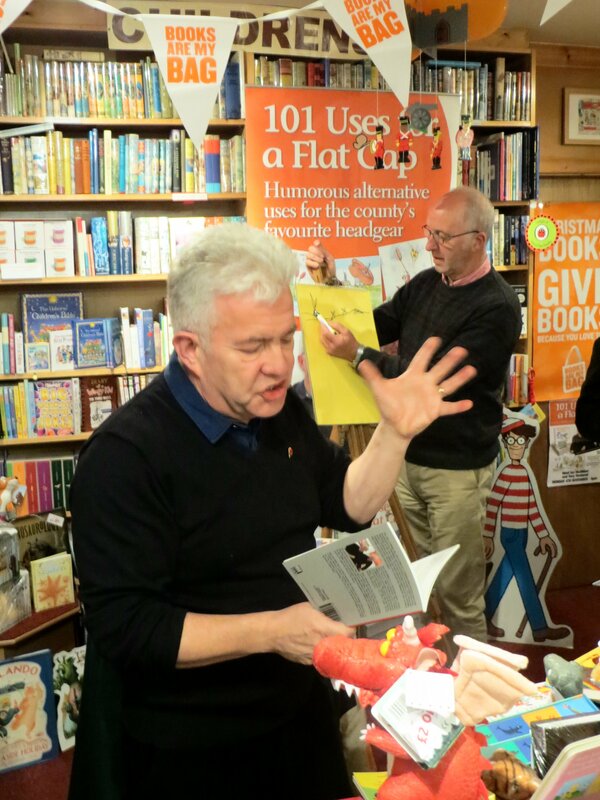 Ian McMillan, South Yorkshire’s own shrewd and very funny poet (the ‘bard of Barnsley’ and ‘poet in residence’ at Barnsley FC), gave a book launch and signing session at Rickaro Books in Horbury yesterday evening. It was an event that I’d been looking forward to for a long time, having heard Ian perform once before, at a school. He is a performance poet second to none. I arrived early at the shop with my husband. Ian was already there, entertaining all the other early arrivals. 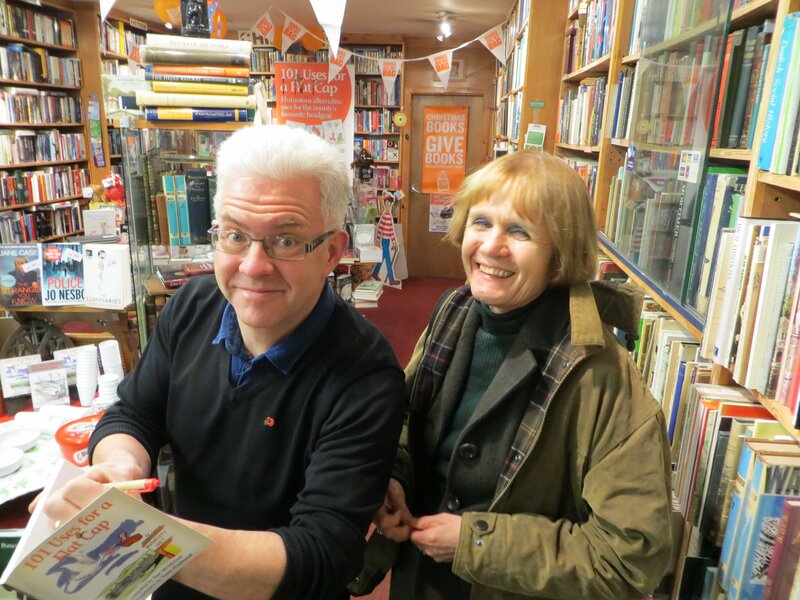 Even Richard Knowles, the owner of Rickaro Books, seemed excited. Richard is professionally lugubrious: his catch-phrase when I worked with him a quarter of a century ago was ‘Life is Cricklewood, not Hollywood.’ Yet he’d invested in a big box of Cadbury’s Celebrations (only slightly dimming the gesture by explaining that they were left over from Trick or Treat night and also instructing his guests to take the Snickers chocolates first, as he doesn’t like them) and shared his special ‘bookseller’s provender’- malted milk chocolate biscuits – with Ian. He had even brought along his flat cap for the occasion. 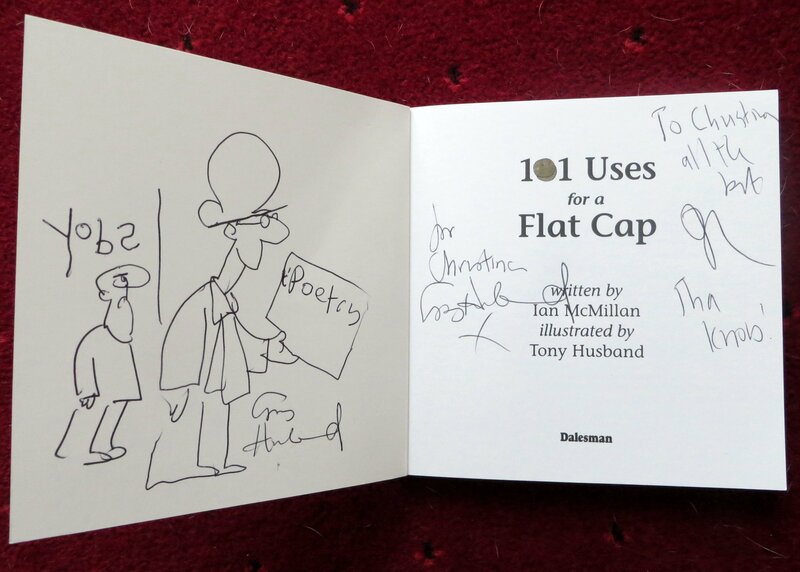 At this point, I should perhaps explain that Ian’s new book, a collaboration with eminent cartoonist Tony Husband, is entitled 101 Uses for a Flat Cap. Published by Dalesman, whose account manager was also at the meeting – he’d kindly brought along copies of all Ian’s books – this latest offering from Ian and Tony does exactly what it says on the tin… er, sorry, book. It consists of 101 pieces about the trademark Yorkshire flat cap, inserted by its author into every possible historical and practical situation: ‘All made up! Every one of them!’ Ian kept on cheerfully insisting. 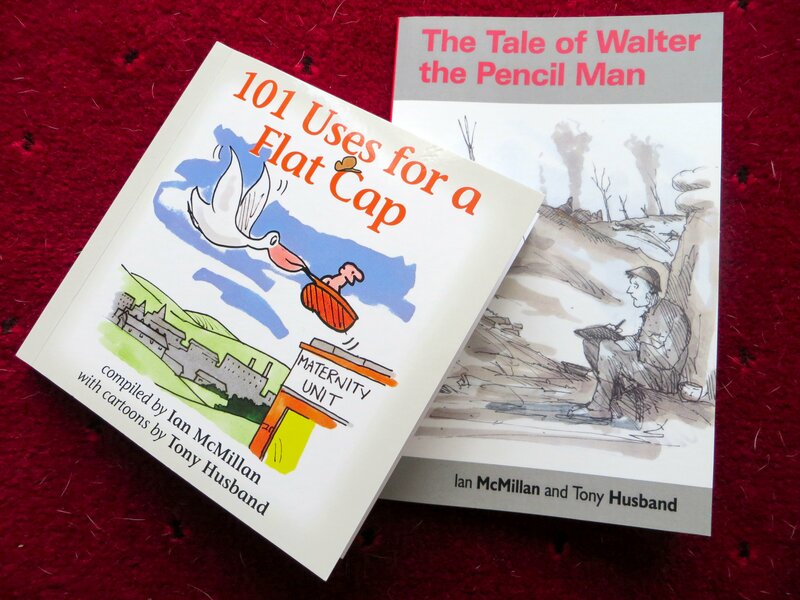 He read several of these poems as well as, with passion, a more poignant extract from another recent title, The Tale of Walter the Pencil Man. Dedicated to his great uncle, Joseph Fletcher, who died at the Somme aged twenty-four, this is the reflective and touching tale of a Yorkshire pit village lad who tries with his pencil and paper to cope with what is happening around him as he fights on the First World War battlefields. It’s very topical, of course, and I’m sure will enjoy many sales this year and next, as we approach the centenary of the start of the Great War. 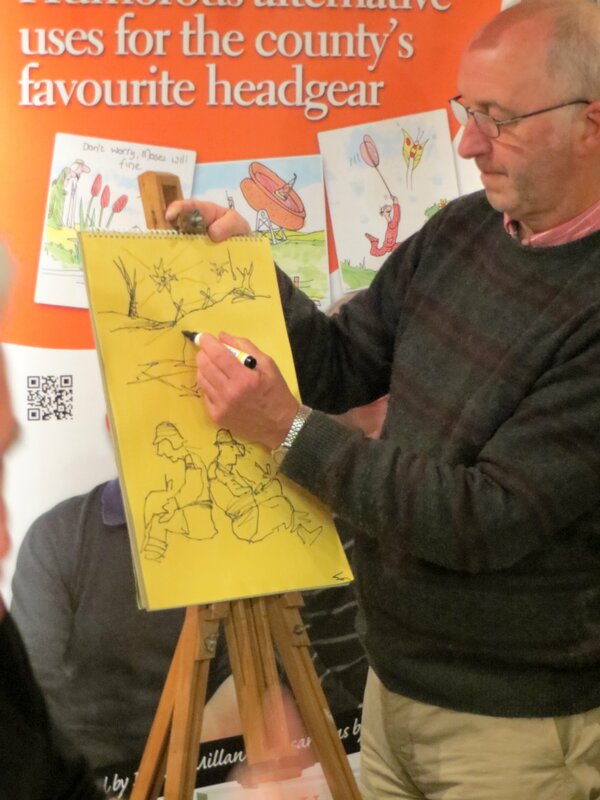 Tony Husband, Ian’s illustrator, accompanied him. It was a real thrill to meet him: he’s a very accomplished, not to say distinguished, artist, who draws for several famous publications, including Private Eye (Yobs), and has been Cartoonist of the Year several times. He told me that he and Ian Hislop arrived at the Eye at about the same time, twenty-five years ago (about the same time that Richard and I ceased to be colleagues!). Tony worked fast and incredibly hard all evening: he not only signed every book that was purchased, but drew a picture in it as well; he also drew a picture to accompany each of the poems, simultaneously with Ian’s recitation, and distributed them among members of the audience afterwards. 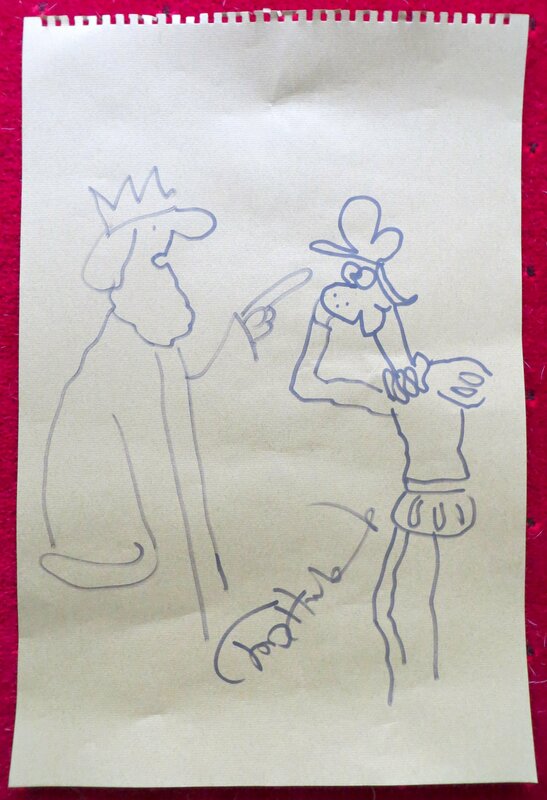 The picture he gave to me, which I shall certainly have framed, illustrates the poem entitled ‘The Flat Cap Scene from King Lear (now lost)’. It’s my particular favourite, not least because it’s arch about Lincolnshire (my home county) and Norfolk (home of my publisher, Salt), though Ian did qualify his comments by saying that he loved South Lincolnshire and even recollected an event that he’d given at ‘one of the Gedneys’ – impressive, as the Gedneys are very small villages in the back of beyond. Lear: Oh fool, what dost sport upon thy head? As Lincolnshire and Norfolk, two flat places in the East. 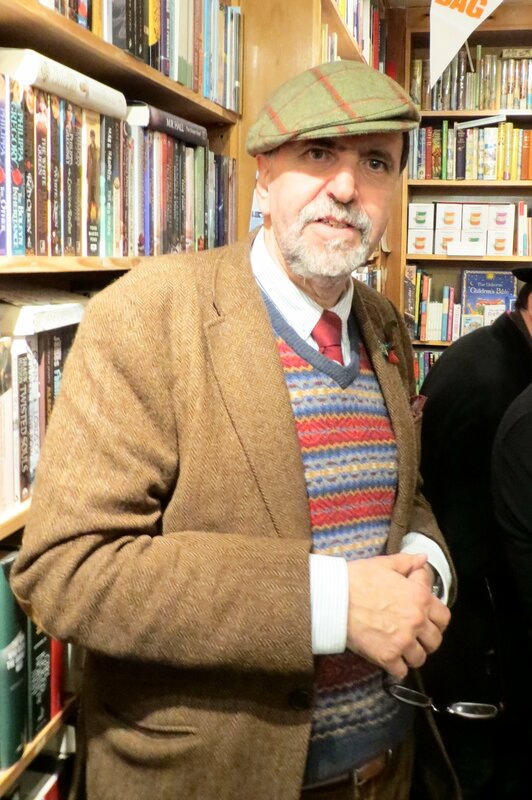 This occasion was everything that an event in a bookshop should be: convivial, hospitable (Richard’s wife Carole provided a delicious and warming mulled wine) and humorous, with a great deal of ad libbing from both Ian McMillan and Tony Husband, as well as from members of the audience. It was extremely well attended and I’m sure that, like us, everyone who was there went home happy and enriched by all the pleasures that it brought. Richard also used the occasion to promote BOOKS ARE MY BAG, an initiative that is close to my heart, as readers of this blog will know. 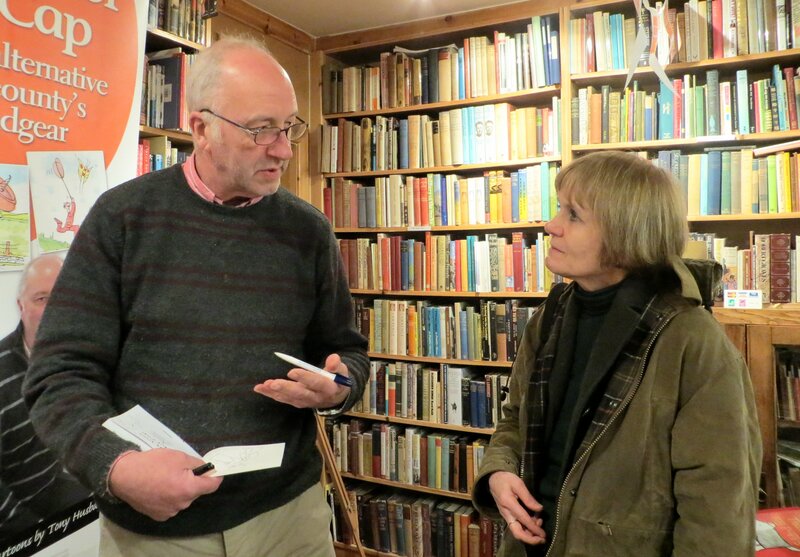 And there was no charge for attending: certain chain booksellers, please take note! I’ve written several times about the importance of place in my novels and how much I admire writers who can evoke a specific place (whether real or fictional) and imbue it with its own particular character and atmosphere. Fictional places that I love include Margaret Mitchell’s Tara, Daphne du Maurier’s Manderley, Evelyn Waugh’s Brideshead and Gerald Durrell’s Corfu (the last perhaps not strictly speaking fictional, but still, I’m certain, an embroidered and selective portrayal of the island as it existed when he moved there with his family). Place names in South Yorkshire are also evocative. There is Silkstone (which sounds beautiful, but was once quite a grim mining village); Hoylandswaine, which reads like the name of a bucolic lover but more prosaically means ‘a spur of land jutting out from a hill’; Durkar (which means ‘grit marsh’, but to me has always sounded Asian: a rather exotic cross between ‘durbar’ and ‘gurkha’) and Goldthorpe and Grimethorpe (the Danish ‘thorp’ referring to a small new settlement next to a larger village). Many of these Yorkshire place-names are Norse or Danish in origin. There is an even greater concentration of such Scandinavian names on the East coast, particularly in the Scarborough – Robin Hood’s Bay area and its hinterland. My all-time favourite is Ugglebarnby. As a family, we’ve passed through Ugglebarnby many times on our way to a day out at the coast. Knowing that ‘-by’ is the Norse suffix for ‘the place of’, we’ve always assumed that Ugglebarnby meant ‘the place of Uggle’s barn’. We’ve had fun speculating about Uggle: we’ve discussed how he probably came storming inland, straight off his dragon-prowed longboat, saw a likely-looking Saxon barn and laid claim to it and the adjoining village, thereafter fighting off all challengers and making it quite clear to whom the barn belonged by emphatically slapping his name on it. My husband and son, both tall and red-haired, and with ancestors in the female line whose surname was definitely of Norse origins, like to imagine themselves as modern incarnations of fierce manly Vikings – sailing the oceans, whirling sharp battleaxes and certainly getting their own way (the desire to do this is still a pronounced family trait) in claiming new territories. They’ve therefore always felt a strong affinity with Uggle. Perhaps because of my own Saxon origins, I’ve imagined him as quite a sinister character, probably reclusive, a hulking, brooding giant emerging like a Rottweiler from his homestead (plus barn) to defend it against all comers. Today I’ve disappointed myself a little, therefore, by looking up Ugglebarnby in The Concise Oxford Dictionary of English Place-Names, only to discover that its meaning is ‘the owl at Bardi’s place’. 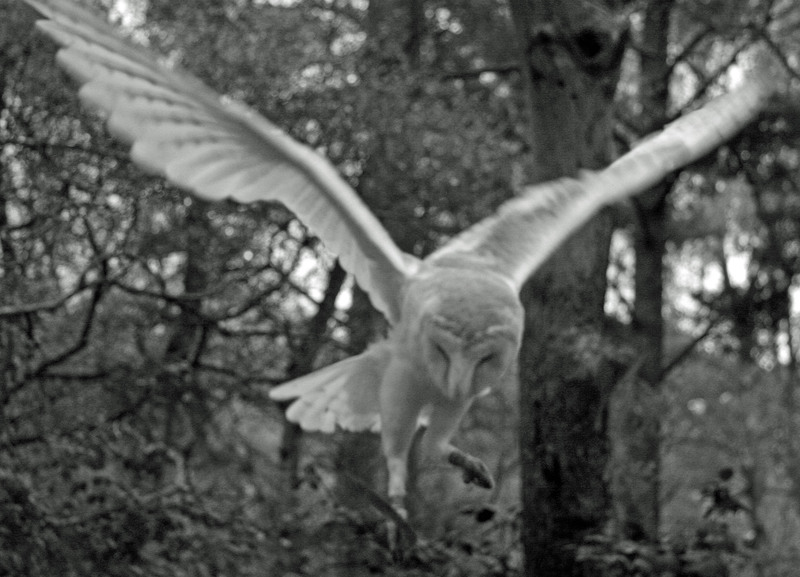 Now Bardi might have been just as bloodthirsty and truculent as Uggle, but somehow I doubt it: he was obviously nice to owls, and whether or not he had a barn is not recorded. A bit of a let-down! We could have looked up the name years ago – The Concise Oxford Dictionary of English Place-Names was left to my husband by his first boss, who died at some point in the 1980s – but I’m glad that we didn’t. If we had, all those fantastical conversations on the way to the coast would never have happened. But one crucial thing hasn’t changed: Ugglebarnby is still a peerless place-name! Perhaps you have your own favourite place names; if so, I should very much like to hear of them.